Test series includes total of 10 Tests. (Each Test Contain 100 Questions). These Tests are completely FREE. Test is available in English Medium Only. Once you submit your test, you will get Result and Explanations to the questions. "Practice Makes a Man Perfect" - The test series will keep your preparation on track. These Tests will be Online and Real-Time Performance Analysis with analytics on your strong and weak areas. 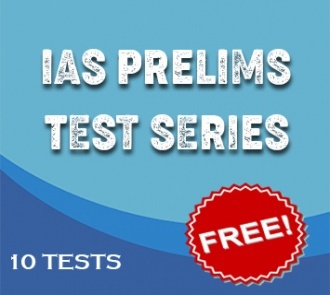 The Prelims Mock Test Series will cover the syllabus of UPSC Prelims. Gets a real-time scorecard with a thorough analysis of your performance using powerful analytics. All India Rank will let you know where you stand in this tough competition. Join our Prelims Test Series to Analyze your Preparation before Prelims'19 Examination. Login with your Email id and password and click on "My Account" button in header(Menu) to access the test. Test will be activated on the scheduled date (10:00 AM). Once test is activated you can attempt it as per your suitable time (Flexible Test Timings). Test will be submitted once you click the submit button or it cross the time limit. After submission of free prelims test you will get your score card and All India Ranking. Detailed model answers with explanation will be provided. Your score and performance chart will be available in your "My Account" section for future access.